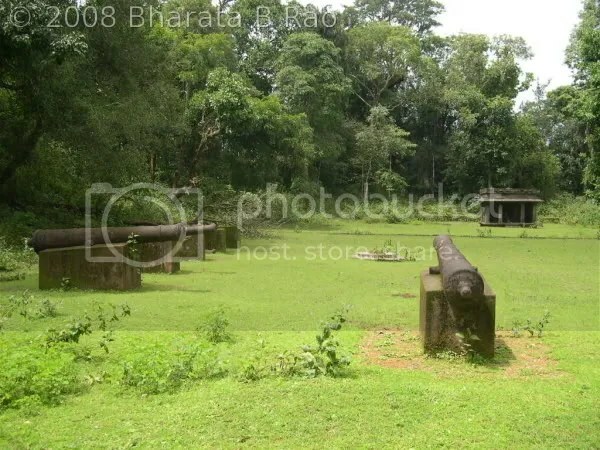 Devkara is a small village present in the border area of Yellapura and Karwar. Now it is mostly an abandoned village thanks to relocation after Kadra and Kodasalli dam projects. But this village hides a natural treasure, a spectacular waterfalls which the locals call Devkara Vajra. Devkara stream falling from approximately 200-300m height near Devkara village forms this waterfalls. Devkara stream eventually joins the Kali river. 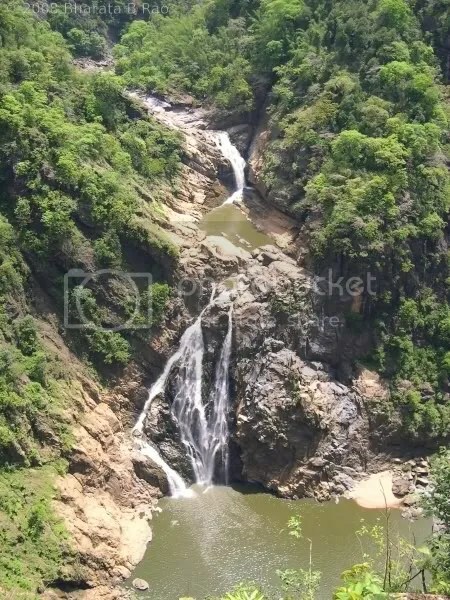 This falls can be approached from the Kadra side as well as from Yellapura side. Here is my story of multiple attempts to reach this waterfalls from Yellapura side. 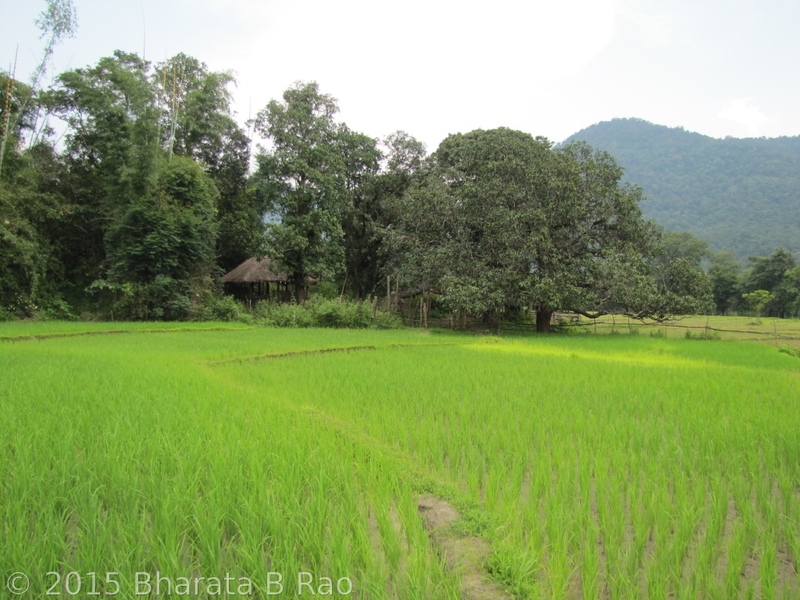 In May 2014, my brother-in-law and I rode a bike from Sonda, Sirsi, traveled to Yellapura and then to ಈರಾಪುರ village. We hardly had any information about the falls then and unfortunately we couldn’t reach anywhere near the waterfalls. All we could get was this distant view of the Kodasalli back waters. However we did establish a local contact who agreed to take us to the falls next time. I was at Sonda, Sirsi in the first week of Oct 2014 and took that opportunity to revisit Devkara falls. This time we reached the local contact’s place at ಈರಾಪುರ village and started trekking in the forest route at 10AM. Along with the guide, our local contact was accompanying us with his school going son. The guide took us on a circuitous route and we first reached very close to Kodasalli reservoir at 11.30AM. 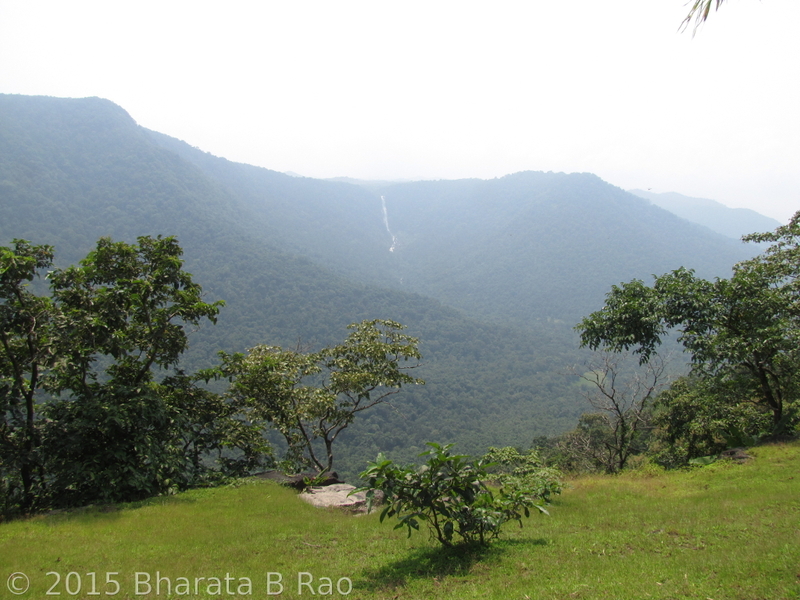 We were walking on a mountain range overlooking a valley in which Kali river was flowing. On the opposite side of the river was another range where the waterfalls was present. After walking through the forest for an hour, we finally emerged out on top of the mountain range at 12.30PM. 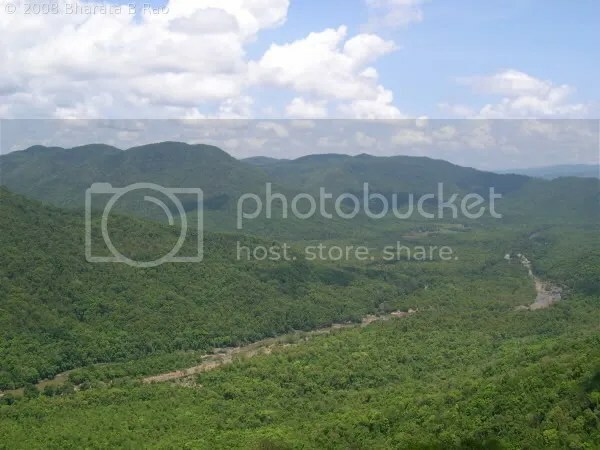 This place was called ಹಬ್ಬು ಕೋಟೆ/ಕಟ್ಟೆ and it provided good view of the distant waterfalls. From that far off distance the falls looked so big and we wondered how gigantic it would it appear from the base. Unfortunately we hadn’t planned for a day long trek and we were just carrying a few raw cucumbers and butter milk which we completely finished at ಹಬ್ಬು ಕೋಟೆ. Since reaching the base of the falls from here was out of question, our guide offered us to take us around a bit and show us a few places of interest. Thus we proceeded ahead on the same mountain range and reached a place called ದೇವಿಮನೆ. This is some sacred place in the hills where the villagers would come and offer prayers once in a year in November. 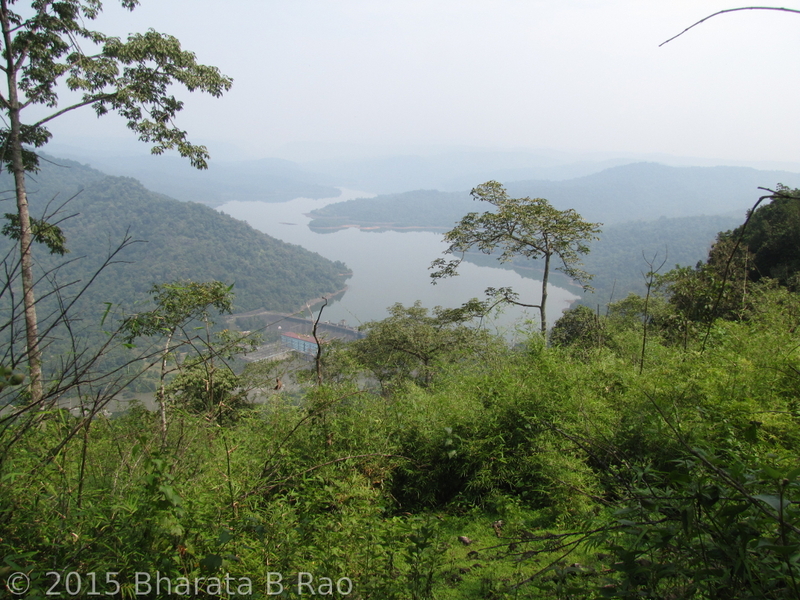 From this place we did venture ahead a bit to get a clear view of Kadra reservoir. Instead of returning back via the same route, our guide suggested that we could do a full circle by getting down to Devkara village and then climb up ಬೆಂಡೆಘಟ್ಟ to reach back ಈರಾಪುರ village. We didn’t really know how much time and effort that would take, but just agreed. After a steep descent we were at Devkara village at 3PM. The village is mostly deserted with a few houses still remaining. There is a Ramalingeshwara temple in the village where Pooja is done once a week. A priest comes from a far off distance every Monday for this purpose. We were now walking beside the Kali river. A trail exists from Devakara till ಬೆಂಡೆಘಟ್ಟ, but were dead tired since we hardly had any solid food since morning. The journey seemed endless and we finally reached the foothills of ಬೆಂಡೆಘಟ್ಟ at 4.15PM. The climb up is abruptly steep and it took quite a bit of effort and time to reach the top at around 5.30PM. Our enterprising guide could find some tender coconuts in an abandoned house and that came as a big relief to us. But the relief was short lived as it started raining. By the time we reached our local contact’s house, we were completely drenched. We consumed the food that we we had planned to have for lunch here and started back on bike towards Sonda at around 6.30PM. Next 60km drive through the winding forest roads was mostly treacherous with non-stop hard rain. Our adventure finally ended when we reached home at 9PM. Though we had seen the waterfalls, that was hardly satisfying since we hadn’t been able to reach the base of the falls. So last week we made another attempt to reach the falls. This time I took Naren with me to my in-laws place. My brother-in-law found a person from Devkara village itself who had relocated to Sonda. He was ready to guide us and we thought our 3rd attempt should be a success since the guide was born and brought up in Devkara village and he should be able to guide us to the base of the falls. 4 of us started in 2 bikes at 8AM from Sonda and reached ಈರಾಪುರ village at 10AM. Thanks to two wheelers, we were able to cover some trail distance too on bike. At 10.30AM we were at the starting point of ಬೆಂಡೆಘಟ್ಟ (470m) from where we had to descend. At 11AM we reached 130m and touched a flowing stream locally called ಈರಾಪುರ stream which eventually becomes Kali river. We walked towards Devkara village alongside the stream and at one point, the falls becomes visible towards our left. At 11.45AM, we reached 70m and crossed the stream which was utmost knee deep. Next we had to cross another stream that flows from Devkara falls and joins the stream that we just crossed. This stream was flowing with good speed and we had to find a suitable place to crossover. 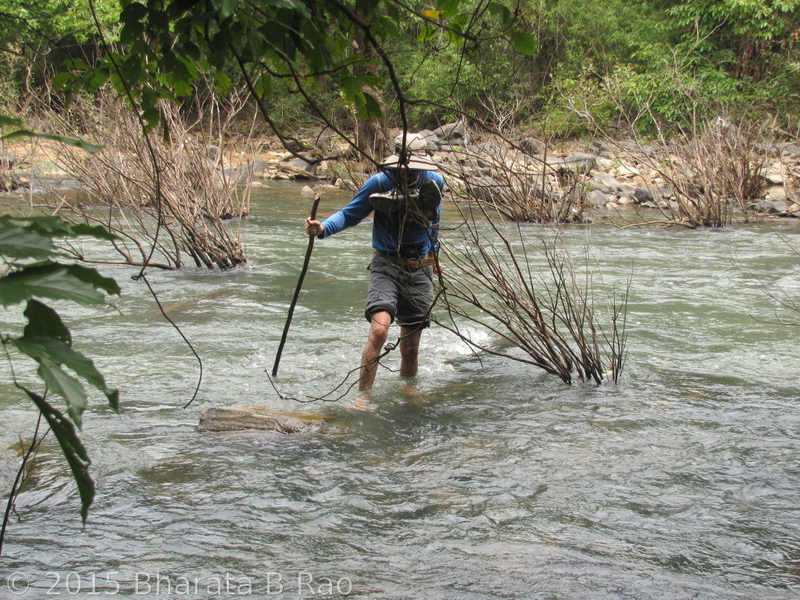 Thanks to our guide, we did find a reasonably safe place to cross the stream where the water was thigh deep at places. We were able to cross it with reasonable ease using sticks for support. We were now at the periphery of Devkara village and were walking along a few abandoned houses and paddy fields. 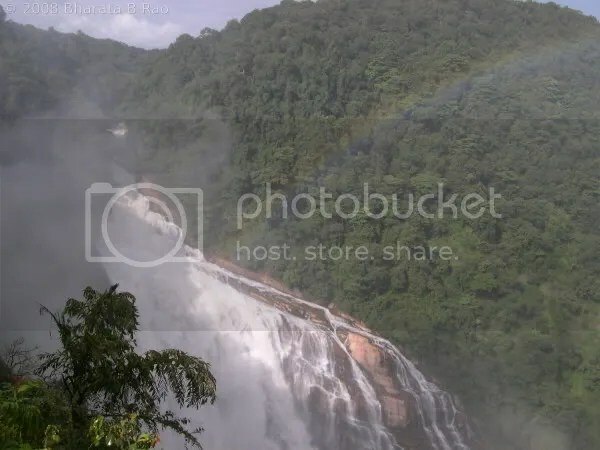 Next it was some hide and seek with the waterfalls as it is located in such a place covered with dense forest towards its approach that it is not visible at every point on the approach path. There was no well defined path to the falls, but we had to make one by clearing the forest growth and following the general direction of the waterfalls. At 1PM we reached a rocky clearance from where the falls was visible fairly clearly. Based on our last year’s experience, we weren’t taking chances with food and hence were carrying sufficient amount of Pulao, home grown cucumbers, butter milk and ಚಕ್ಕುಲಿ. We finished lunch on these rocks. We had still not reached the exact base of the falls and hence ventured into the forests a bit more to check if better view of the falls could be had. At 2PM we reached another rocky clearance from where we had a decent view of the falls. We decided to end the quest here since the path ahead to the ultimate base of the falls was difficult and it was already well past midday. On the way back, it took two hours for us to reach ಬೆಂಡೆಘಟ್ಟ base and after an hour we were back at ಈರಾಪುರ village. Thus on the third attempt, we finally had satisfying views of Devkara falls! It was not just about the falls, but this also turned out to be good trek worth remembering after my previous trek in the same area. 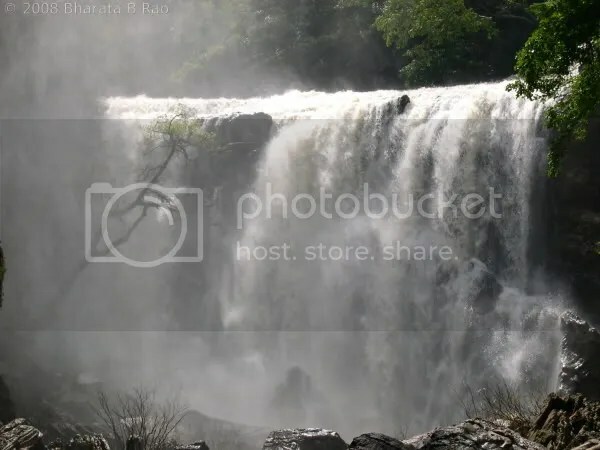 During my previous visits to my in-laws place in Sonda, Sirsi I have visited various waterfalls. While I described Mattighatta falls here and Benne Hole falls here, the rest of the waterfalls in the Sirsi-Yellapura region are covered here. 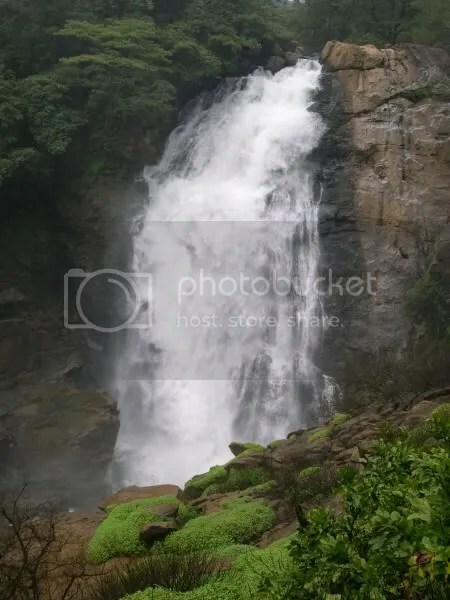 When it looked like I have visited most of the waterfalls in the region, I came across Burude falls which is located in Siddapura taluk of Uttara Kannada district. As usual, my brother-in-law and I started quite early on a Sunday morning with the intention of seeing Burude falls as well as Wate Halla falls which I had unsuccessfully attempted a few years back. We were doing this in November which is usually a good month to visit these remote waterfalls. Some of these waterfalls are so remote that two wheeler is the best mode of transportation to reach them. We first reached Siddapura from Sonda, Sirsi and continued on Siddapura-Kumta road for around 20km reach a place called Kyadgi. Just after Kyadgi, one can see a sign board instructing us to take a right deviation for Burude falls. From here it’s around 5km to the falls. Somewhere midway on this road, we had to cross a stream on bike and continue on road on the other side. 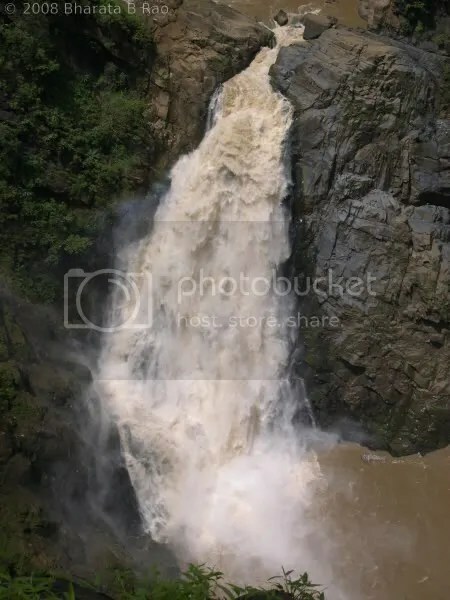 Then we cross a small cluster of houses name iLimane due to which this falls is also referred to as iLimane waterfalls. One can drive up to the point where tourism department has built an open shelter for tourists. After descending down 20 steeply built concrete steps, we had to do some serious descent to reach the base of the waterfalls. 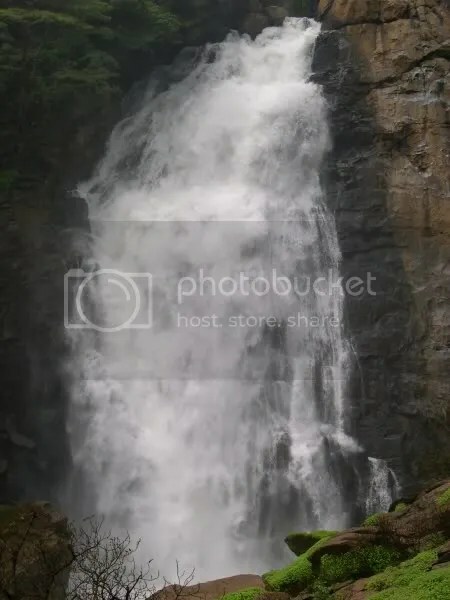 The waterfalls is absolutely not visible from the shelter and steep descent makes this falls almost unapproachable for family kind of tourists. The river flows down in 5 steps here, each forming a nice waterfall. Only first three of them are visible and one could reach the top of the 4th one but not the base. We did make some attempt to reach the base of the 4th waterfall, but the vegetation was simply too thick and we had to retreat. There was enough water in the stream even in November to make the visit worthwhile. 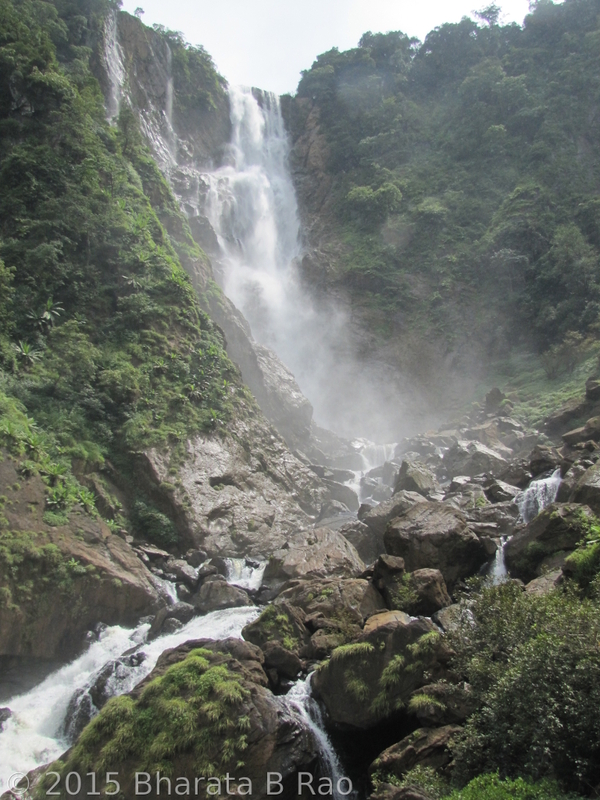 It will be very difficult to visit these falls in rainy season due to leeches. The ideal season to visit is between September and November. I had attempted this waterfalls in September 2009 with my wife and other relatives. While we were descending to reach the falls, my wife and I lost the guide and others in the front and were forced to come back. There were so many leeches that it was impossible to stand there a second without a leech getting on to us! This time I was hoping that it would be more easier since it was November. This falls is approachable from Nikunda on Sirsi-Kumta road. At Nilkunda, take a right deviation into Nilkunda-Devimane road. After a kilometer from here, a stream cuts the road, and after the stream the road forks. The right hand fork is easy to miss, but this is the road that will lead to Wate Halla falls. The stream can be crossed on bike most of the seasons except during the rainy season. After a kilometer’s walk from here, one can see a path descending down into the valley which will take us to the Wate Halla falls. We couldn’t see any other possible routes down the valley anywhere nearby except this one. A steep descent of 100m will take us to the base of Wate Halla Falls. The stream flows down in 3 steps here forming 3 waterfalls. Wate in Kannada means a variety of bamboo and Halla means valley. The waterfalls thus gets its name due to the abundant presence of this variety of bamboo in the valley. Visit to Wate Halla falls can be combined with the Unchalli falls which is quite nearby. Again its impossible to reach the base of this falls in rainy season and mostly difficult until September. For those interested in temples, its worth a quick visit to this temple in Nilkunda. A few more places of interest around Sonda, Sirsi. 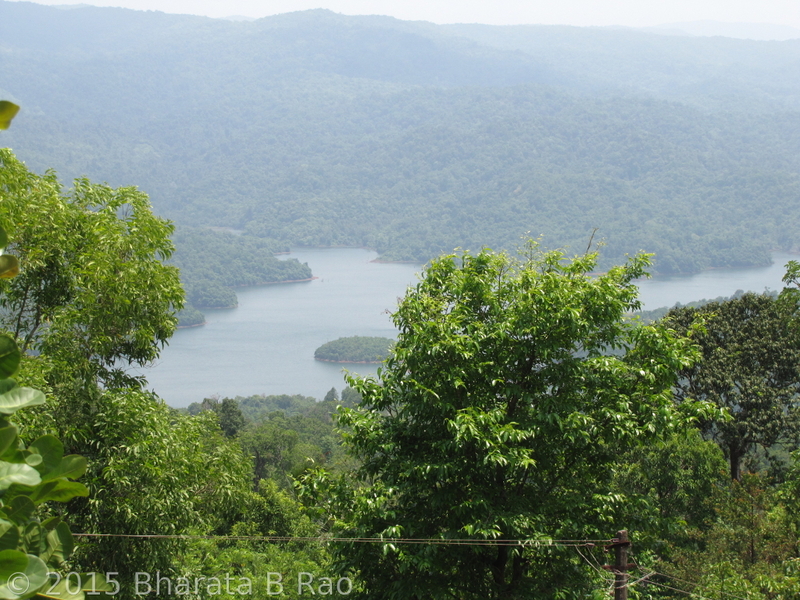 In one of my last blogs, I described many places of interest around Sonda, Sirsi. Last weekend I was in Sonda and explored a couple of more places: a beautiful waterfalls known as Benne Hole falls and a newly rennovated temple. 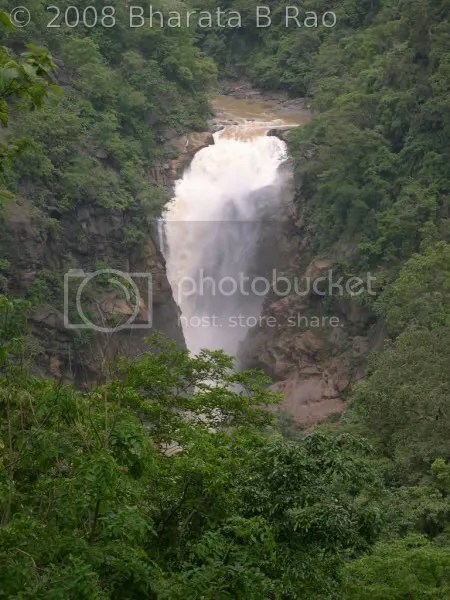 There are quite a few falls in the Sirsi-Yellapur region. 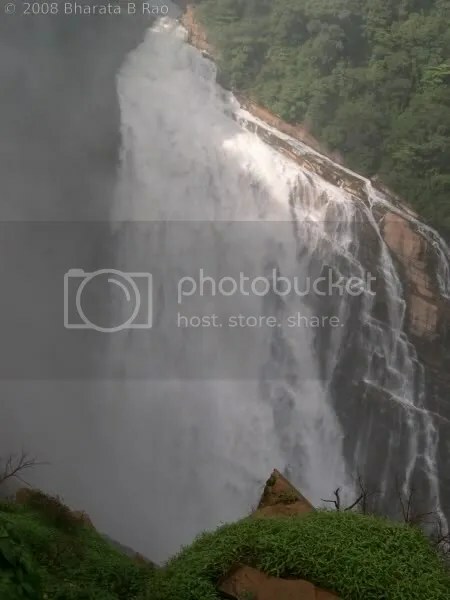 Magod, Shivagange, Satoddi, Unchalli falls are well known. Another falls which is as majestic as any of these is the Benne Hole falls. This falls is approchable from Sirsi-Kumta road. At 26km from Sirsi towards Kumta, we get a village named Kasage. Near this village, a village road deviates towards left which will lead to the falls. Kasage village is situated after Bandala Ghats and before Devimane Ghats. The village road is unfit for any car and only jeeps will ply on this road. Only first 4km is motorable and remaining 2km has to be done on foot. We were on a bike which probably is the best mode of transport on such roads. The route runs through what appears as forest and has many turns and forks. Not knowing which turn would take us to the falls, we went straight until the road ended in a small hill with a valley on the other side. Listening to the sound of water flow, we descended down the valley which was full of leeches and reached the stream and not the falls. Unwilling to take further chances, we climbed back, reached the road, back-tracked and took a turn which led to a farm house. The inmates gave us the right directions to the falls after which it was quite easy, but we still had to cover the last kilometer on walk which involved a descent towards the end. The area was full of leeches. September to November is probably the best season to visit this falls. The waterfalls is formed by the Benne Hole stream falling from an approximate height of 200-300ft. Benne Hole stream eventually joins the Aghanashini river. The stream was in full flow and matched its name (beNNe means Butter in Kannada) aptly. A local mentioned that the falls remains attractive only till December end with full water flow. One can reach the botton of the falls only when the rains have subsided and rocks are dry. Bakkala is a village at around 18km from Sirsi on Sirsi-Sonda route via Hulekal. After 2km from Hulekal, there is a left deviation which leads to this temple. 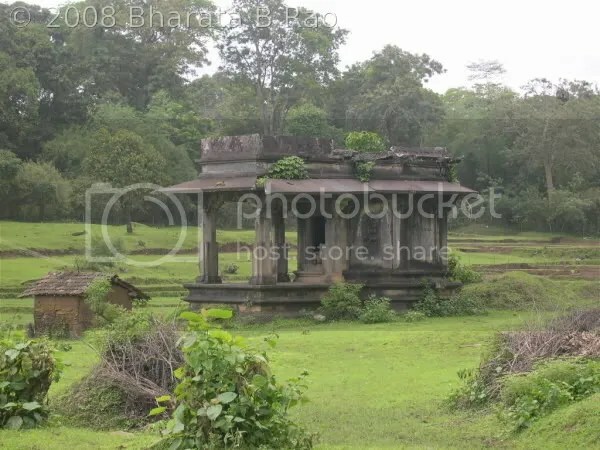 Bakkala (corrupted form of Bakula) is a historic place and is believed to be in existence from Ramayana times. This place finds a mention in Satyanatheshwara purana along with Yana. It is believed that when Hanuman was carrying Sanjeevini hill to Lanka, parts of Sanjeevini plants fell here. This place is known for medicinal plants and a botanical garden comprising these is being maintained here. 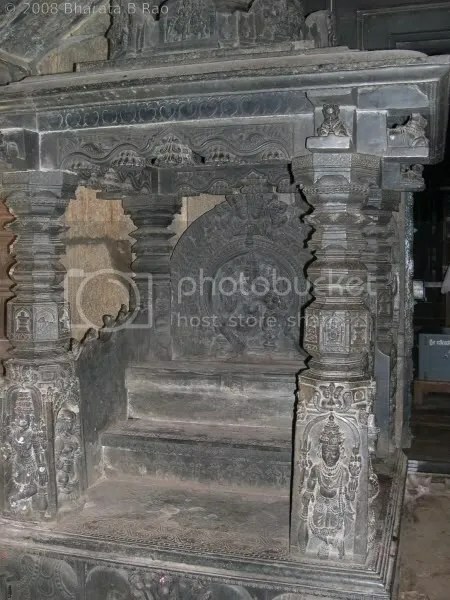 The accurate period when the temple was built is not known but is estimated to be built b/n 1555 and 1610AD in Arasappa Nayaka’s time who was then ruling Sudhapura (which is now called Sonda). Temple rennovation work was started in 1999 and was mostly completed in 2009. Some parts of the roof are still incomplete. 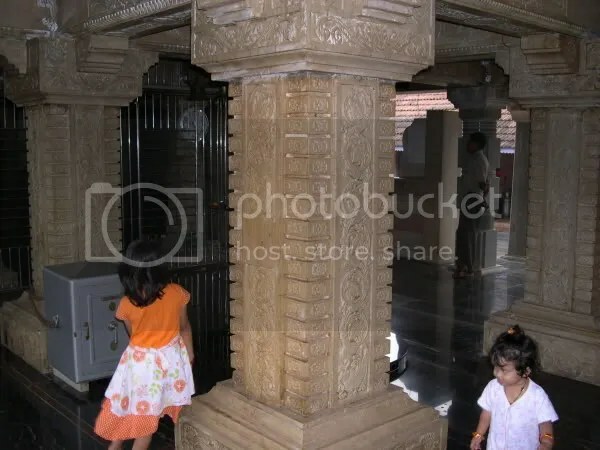 Looking at the amount of work done in 10 years in this temple, it is hard to imagine how much time and money our ancestors would have spent in building all those stone temples which are scattered all over Karnataka and elsewhere! The temple exterior and pillars have been re-done using pink and white sandstone. 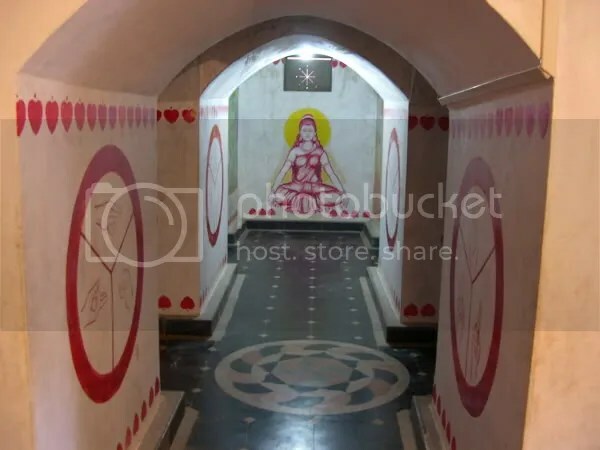 Underneath the temple, below the ground level, a Dhyana Mandira has been built which is very artistically decorated with various paintings involving Yoga mudras, chakras, asanas, dance postures etc. 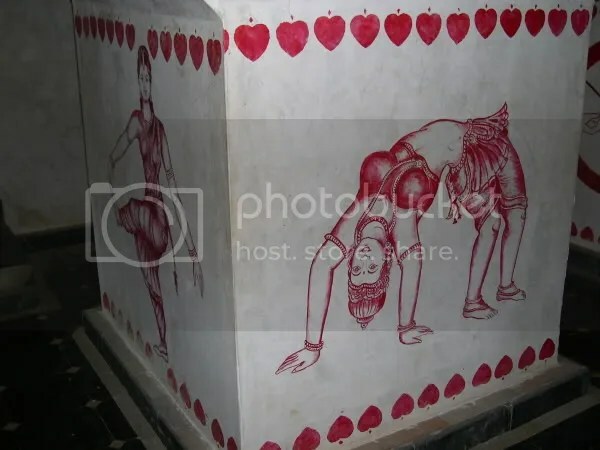 The story describing the uncovering of the Shivalinga and subsequent establishment of this temple has been pictorially carved on the temple walls. 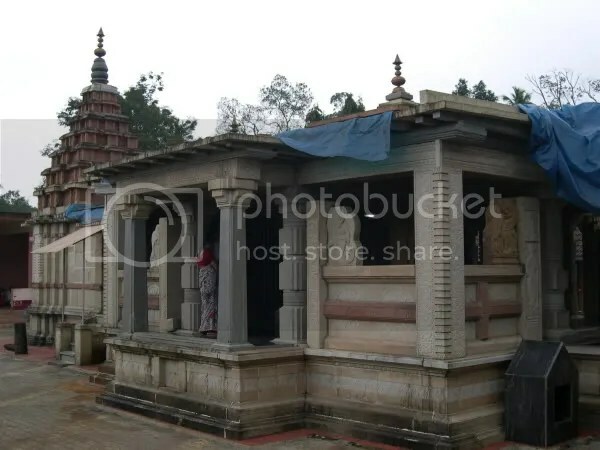 This temple is worth a visit anytime if you are in Sirsi or Sonda. If not for anything, one should visit this temple to understand what it takes to (re-)build a stone temple. One can’t but appreciate the efforts that would have gone into building of our ancient temples. I was mostly unaware of the natural beauty of Uttara Kannada district of Karnataka until my marriage to Veena who hails from Sonda. Since then I have done quite a few visits to Sonda and visited numerous places around it and amazed by the tourist potential (still not fully tapped though) of this green district. 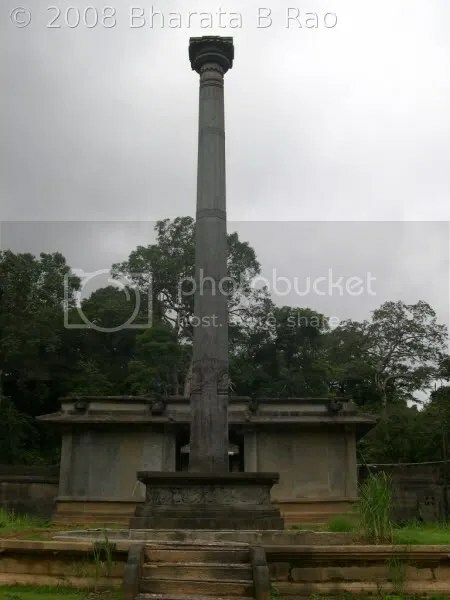 Sonda is small little village in the Sirsi taluk of Uttara Kannada district situated at a distance of around 450km from Bangalore and 20km from Sirsi. 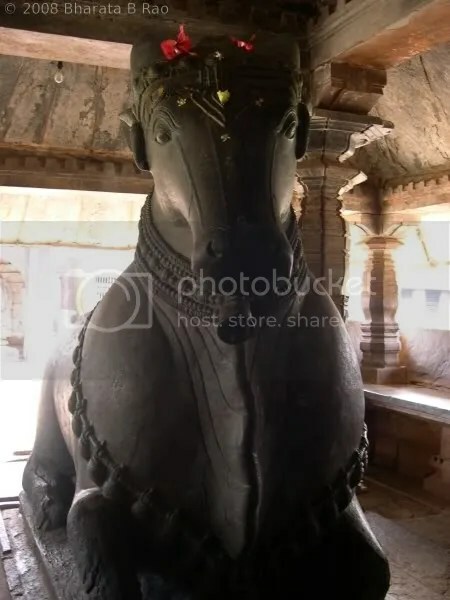 It is mostly known as a pilgrimage center due to the presence of three prominent Mutts: the Swarnavalli Mutt, the Vadiraj Mutt and the Jain Mutt. These attract hundreds of pilgrims mostly through out the year. The green surroundings, typical to the Malnad area of Sonda and Sirsi add to the serenity of these places of religious importance. Here are some of the places I have visited around Sonda, Sirsi, since last 3 years. Please note that all distances mentioned here are mostly approximate. 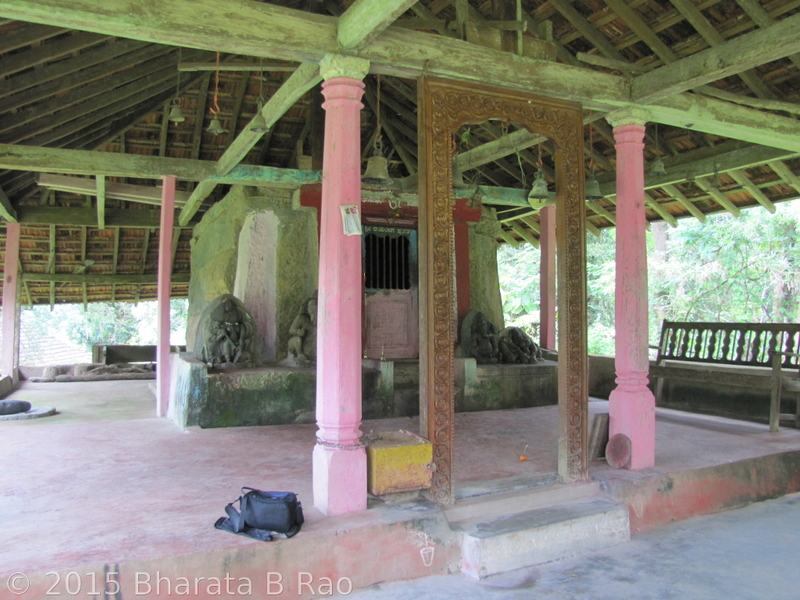 Banavasi, which was once the capital of Kadamba rulers is situated at around 20km from Sirsi. The village road from Sirsi to Banavasi is very picturesque with green fields all round. There are a few sugarcane fields also which set up the traditional sugarcane crushing units for preparing jaggery (called Aalemane in Kannada) during Jan-Feb. If you are here during this time, you would want to stop by one of these places. You would be offered generous quantities of sugarcane juice straight out of Aalemane. One should taste this know how this differs from the cane juice available in the cities. 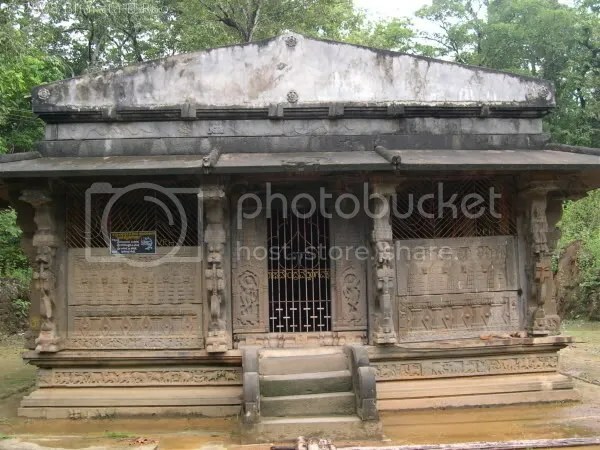 The 9th Century Madhukeshwara temple of Banavasi is dedicated to Shiva. It is a fairly big temple and is well protected. The ornate pillars add to the beauty of the temple. Just outside the Sanctum Sanctorum, a stone structure is placed which looks like a throne or a couch. 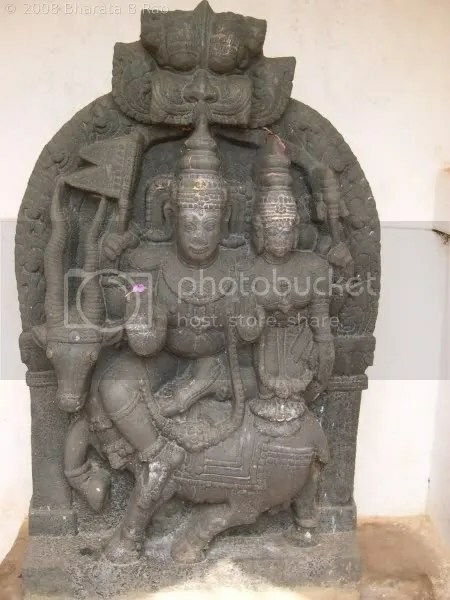 There is a beautiful bull (Nandi) in front of Shiva but interestingly it appears to be watching Parvati who is present in the adjoining temple. The temple campus has many beautiful stone idols of Gods and Goddesses. River Shalmala flows quite close to my in-laws house in Sonda. 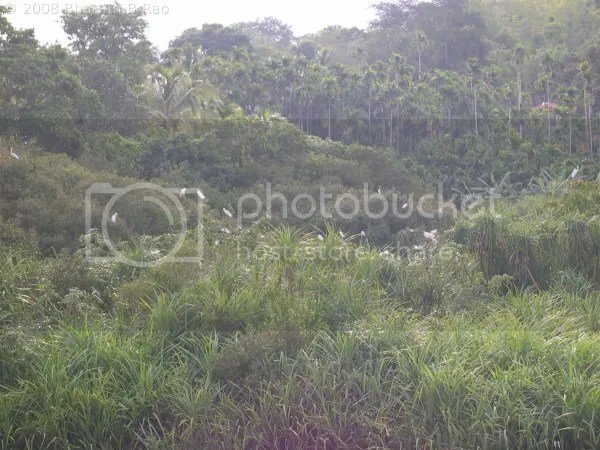 I have to just cross a few arecanut farms and paddy fields to reach the well known pilgrimage center in the river Shalmala called Sahasralinga. 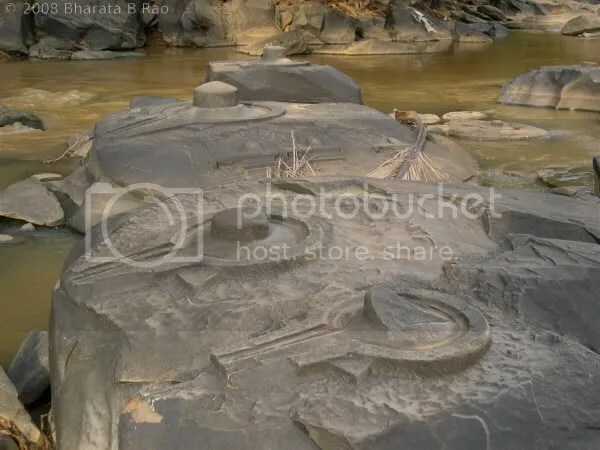 The place gets its name from the numerous (Sahasra = thousand) Lingas carved on the rocks of Shalmala river. 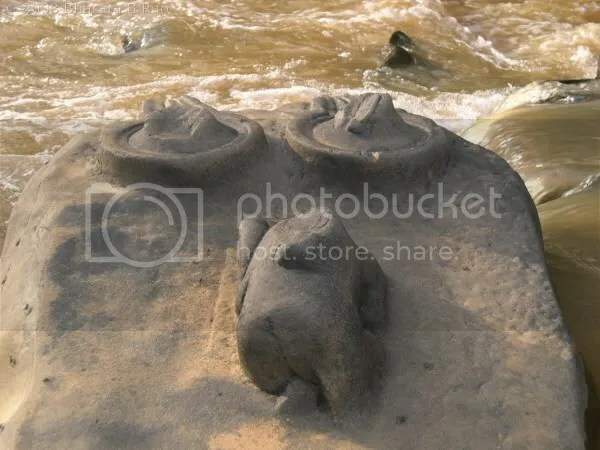 Lingas with Nandi of all shapes and sizes can be seen here, some of them dislodged due to the force of water flow. 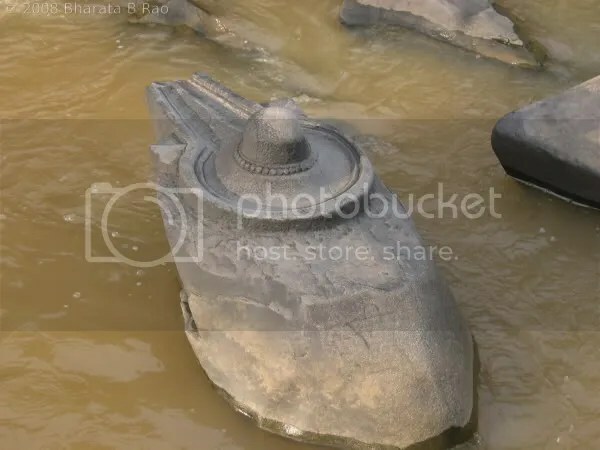 It is better to visit this place when the water level is low when all the Lingas become visible. Sahasralinga, is approachable from Hulgol, on Sirsi-Yellapur road at around 15km from Sirsi. This place becomes a center of activity on Mahashivaratri day when people throng here to offer Pooja. 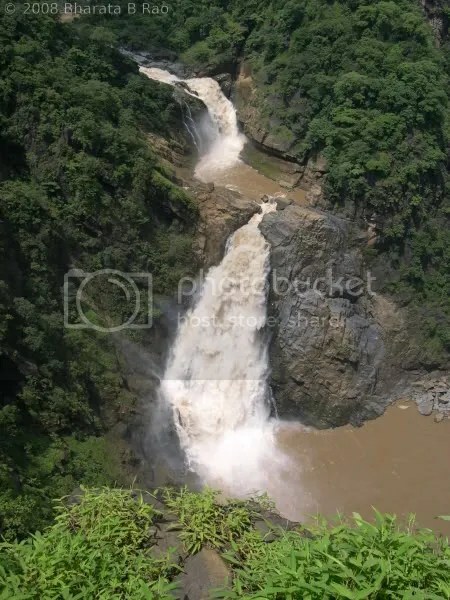 Magod waterfall is formed by river Bedti which falls in two steps forming two falls. 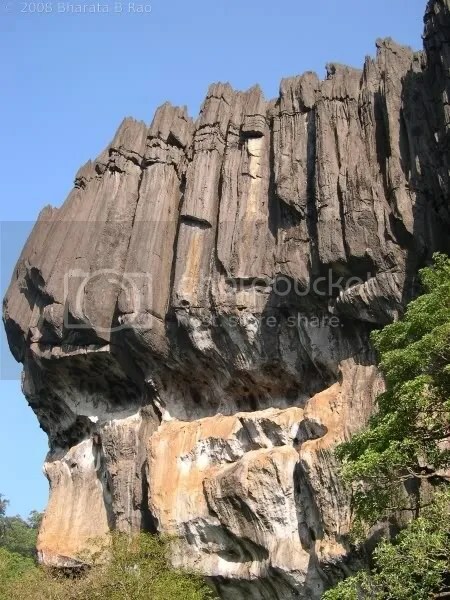 Though one could use an interior village route (Sonda – Upleshwara Cross – Magod Road – Magod Waterfall) to reach this waterfall from Sonda, the ideal way to reach this is from Yellapur which is around 50km from Sirsi. After traveling on NH63 from Yellapur for around 5km towards Ankola, there is a deviation on the left which goes to Magod Waterfall. The waterfall is around 15km from here. The road is reasonably well maintained and one can drive up the falls in a 4 wheeler. Magod waterfall is visible at some distance from the viewpoint in the valley. From here, it is not possible to reach the base of the waterfall. 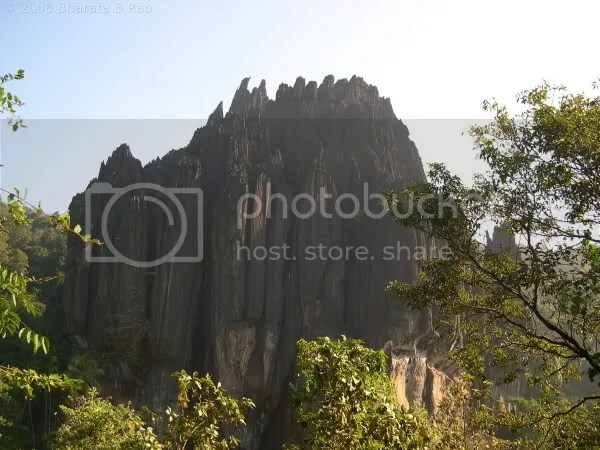 A nearby place to visit along with Magod waterfall is the Jenukallu gudda viewpoint from where River Kali is visible. 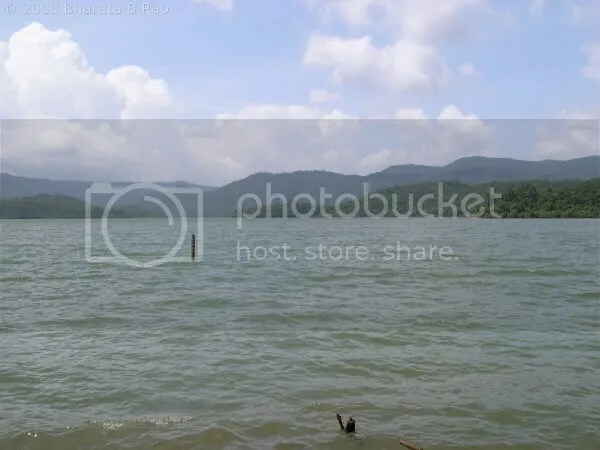 If you take the interior road from Sonda to Magod waterfall via Upleshwara, you could visit the Kavdekere en route which has a big lake and a temple. 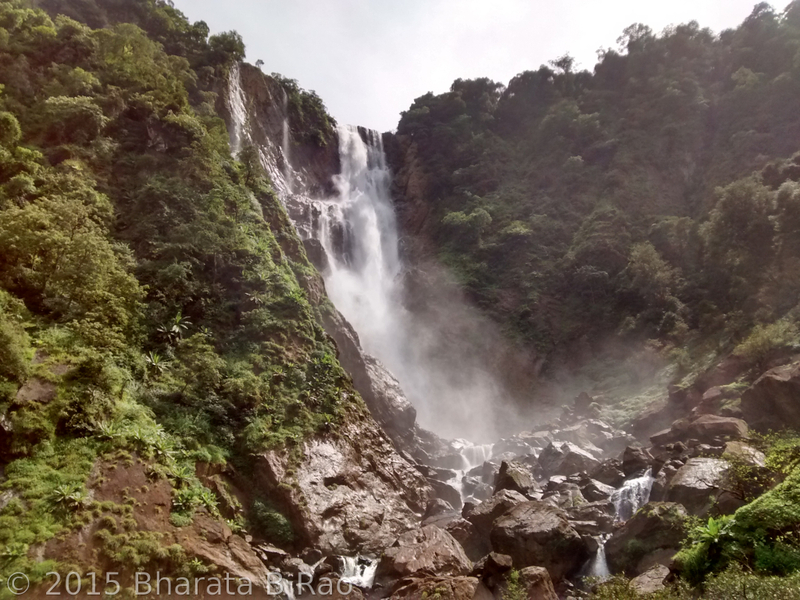 River Aghanashini forms a spectacular waterfall called Unchalli waterfall in a deep jungle. 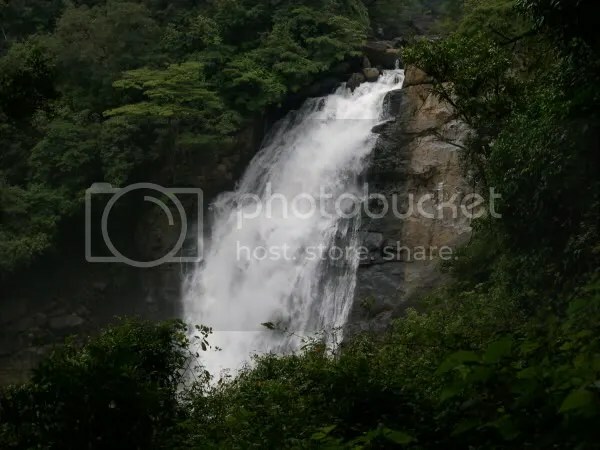 To reach this waterfall, start from Sirsi on Sirsi – Kumta road and reach Aminhalli (around 14km). From here a left deviation leads to a village called Heggarne (around 19km from Aminhalli). The road is decent until Heggarne. From Heggarne one has to travel around 2-3km on a jeep track to reach the viewpoint of the waterfall. This last stretch is distance is best done in a hired vehicle or by walk. From the viewpoint the falls is visible at a distance. Steps have been built from here to another viewpoint still down the valley which is built directly opposite the waterfall. The water flows down at a great force raising up a cloud of water drops that could easily drench anyone at the viewpoint. It is common to find leeches in this area. Again one can’t reach the base of the waterfall from this viewpoint easily. 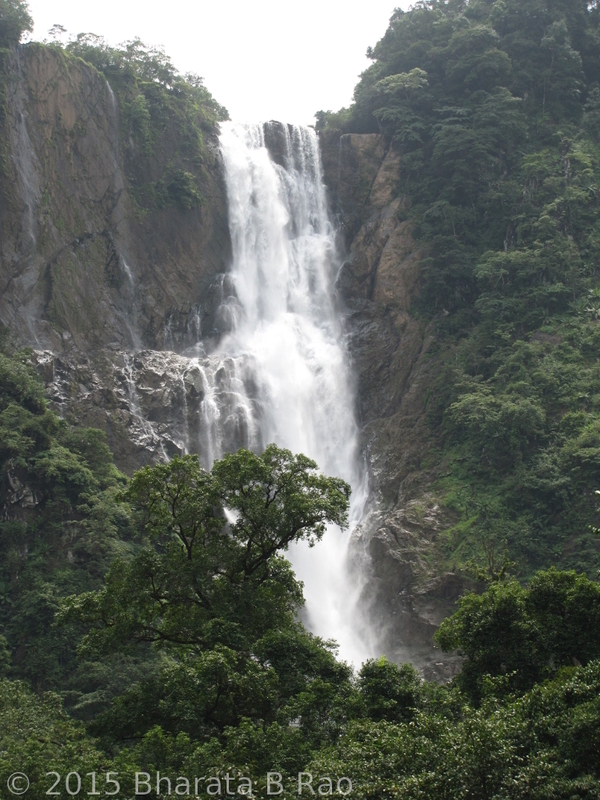 Satoddi waterfall is formed by River Kali(or may its tributary) and is situated in Yellapur district. To reach this, start on Yellapur-Hubli highway (NH63), proceed around 2-3km and take a left turn into what is called Bisgod road. From here, proceed around 20-25km to reach a place called Kattige which has a Ganesha Temple. From Kattige Ganesha temple it is around 8-10km of jeep track to the waterfall. I visited this waterfall with my brother-in-law in September in a motorbike and it needed all the village-riding skills of my brother-in-law to negotiate the final few kilometers of slushy road. Even walking would on this road would be difficult with so much of slush all around. But all the effort is worth as this is one of the waterfalls whose base can be easily approached. This waterfall is present upstream after the backwaters of the Kodasalli dam. 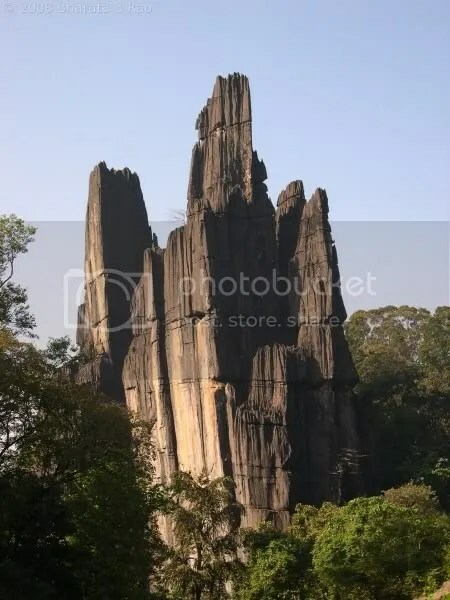 Sonda was once a royal city ruled by Swadi Kings and one can still see some of the remains at various places around Sonda. One such place is the Sonda Kote which is present on the banks of River Shalmala. Though it is called Kote, I couldn’t find any fort here. It looks more like a place where some royal remains have been protected by ASI. A small temple, a few cannons and a decorated single stone Kallina Mancha (Stone Cot) are preserved here. Muttinakere is a small lake in Vaja Gadde area of Sonda. Alongside this lake is a small but beautiful 17th Venkataramana temple built in Vijayanagara style. This temple has been renovated and is well maintained. 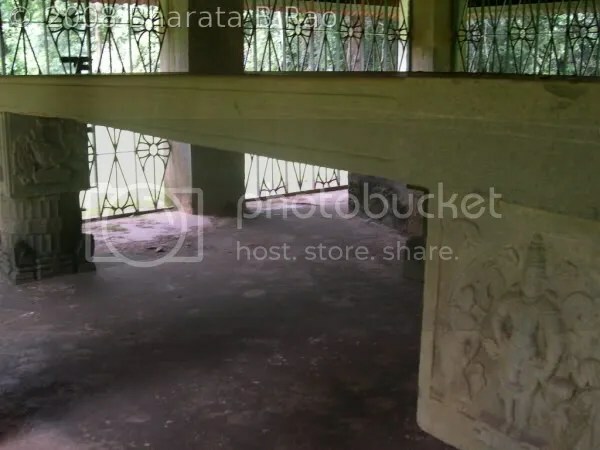 A visit to this temple is worth if you are in Sonda. Daily pooja is performed here. 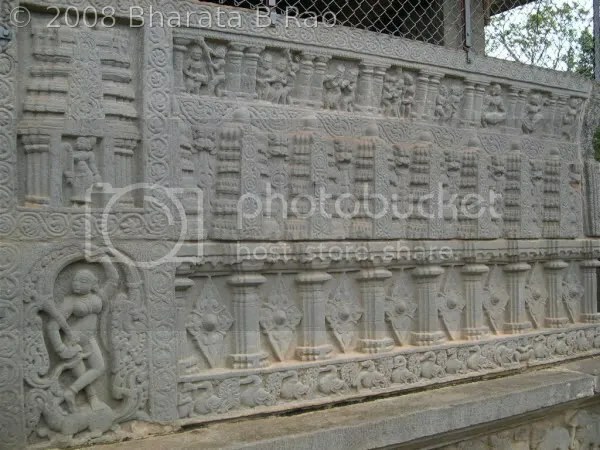 This is another small temple present in Sonda dedicated to Venkataramana. 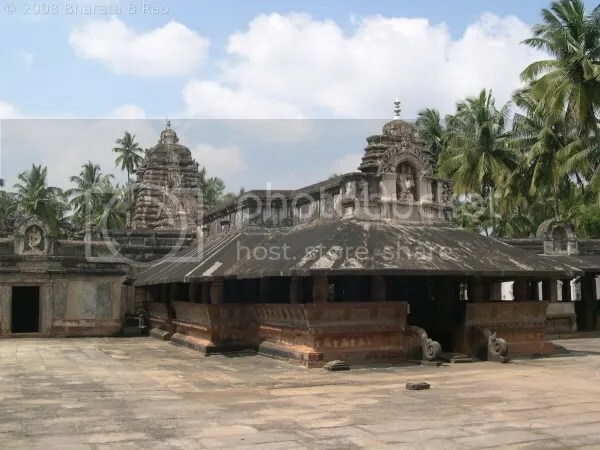 To reach this temple, from Kamatgeri in Sonda, proceed towards Sirsi for around 1km and take a left deviation and proceed another 1km on the un-asphalted road. There is a lake alongside the temple. 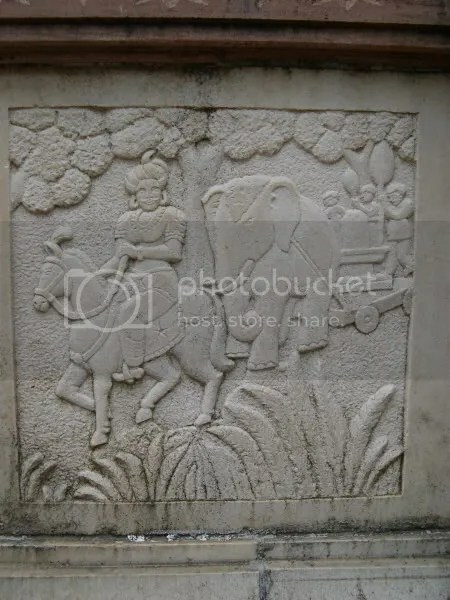 The carvings on the temple walls are interesting. Daily pooja is performed in this temple. This waterfall is formed by River Shalmala (As far as I know). 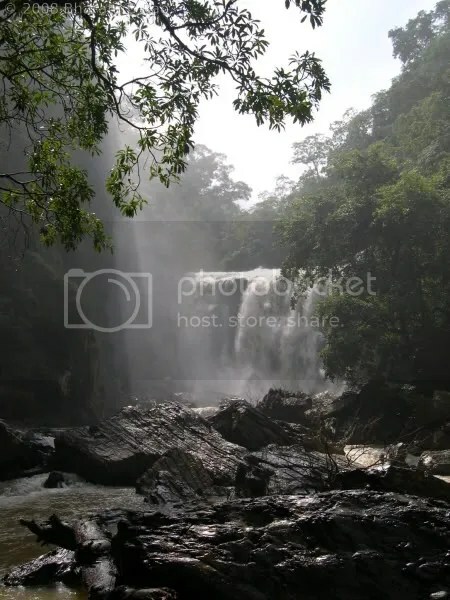 The approach to this waterfall is from a place called Hulekal, which is around 13km from Sirsi towards Sonda and 5km from Sonda towards Sirsi. From Hulekal, take the Jaddigadde road and travel for around 25km to reach Jaddigadde. From here it is around 2-3km on a Jeep track which is best negotiated by walk or a two wheeler. A viewpoint has been built from where the waterfall is visible at a distance. 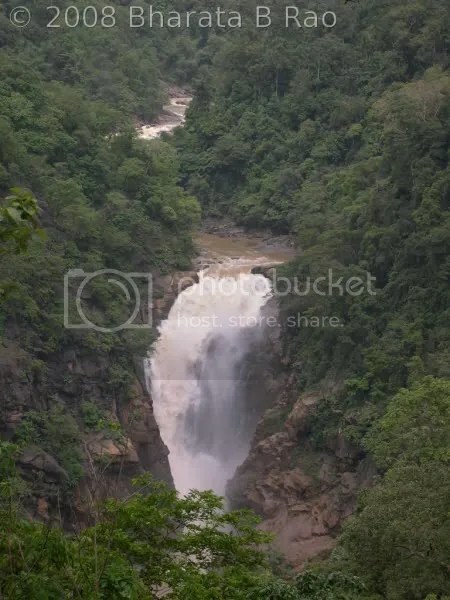 Me and my Uncle tried to descend down the valley to get closer to the falls but after a while found it too hard to negotiate the thick forest growth in the monsoon season. So had to return satisfied by the long-distance view of the waterfall. There is a small lake called Mundige Kere in Sonda which attracts hundreds of birds (mostly Cranes as per my very limited knowledge about birds) in June. I am not sure if this can be called a sanctuary, but is definitely a place is worth visiting when you in Sonda and have some time to spare. From Kamatgeri in Sonda, proceed a few yards towards Yellapur and take a right deviation near Kasapal primary school and proceed a 1km further. Yana has become a very popular tourist spot now with hundreds visiting it in the weekends. So no more details except for a few photographs. – with inputs from Veena Bhat, Vinayak Bhat, M S Bhat and Krishnamoorthy Bhat. You are currently browsing the archives for the Waterfalls category.